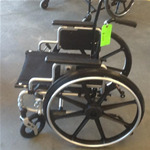 Gently used Invacare 16" wheelchair seat area is extended to 18" depth Please call for details and pricing! 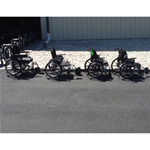 Gently used wheelchairs that have HEMI kits installed to lower overall heght of chair. available in 16" 18" 20" please call for more details and pricing! The Breezy® Elegance Silver provides comfort, support, and security for you and your loved ones. Available exclusively at our Premium Retailers, the Elegance Silver offers superior quality at a comfortable price. Breezy® Elegance Gold offers increased adjustability and control, allowing you and your loved ones to enjoy activities without hassles or discomfort. The Elegance Gold is available exclusively at our Premium Retailers.